Feb. 28 – The invention of the internet created an accelerated growth route for countries and companies, transforming the world into a place in which digital connections are just as important as human connections. Despite the internet originating in North America, it has grown into a worldwide phenomenon, rapidly expanding internationally. Thanks to the growing number of fiber-based broadband connections in China, Japan and South Korea, Asia has quickly built up its broadband capabilities. 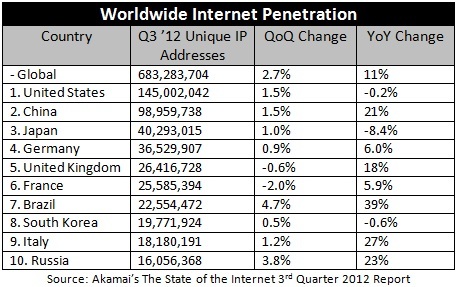 The number of internet users has exponentially grown, especially in Asia. The region now accounts for 42 percent of the world’s internet users. 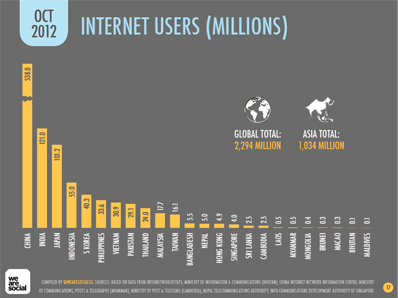 In 2012 alone, Asia gained an additional 102 million new internet users at an average of 11,350,000 new users per month. The region also maintains an estimated internet penetration rate of 27 percent, and has a total of 1.04 billion internet users, up from 418 million in 2007. As the internet grows into an everyday household commodity, the only thing that can match how quickly it spreads is the speed at which it connects. A recent international survey by content delivery provider Akamai Technologies has found that out of all the continents in the world, internet speeds are at their fastest in Asia. Countries in the Asia-Pacific region accounted for the highest average internet connection speeds in the world. 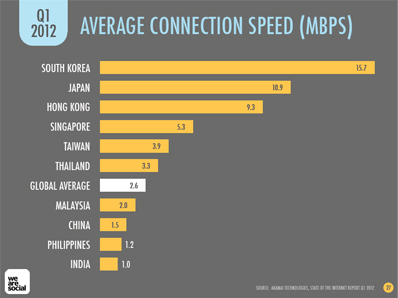 In its survey, Akamai notes that the top three countries with the fastest average connection speed remained constant, with South Korea (15.7 Mbps), Japan (10.9 Mbps) and Hong Kong (9.3 Mbps) coming in at the top of the list. Interestingly, however, as fast as Asia’s average speeds are, the region is also home to countries who have some of the lowest speeds in the world. The average connection speed in India was found to be 1 Mbps, while Indonesia’s internet speed clocked in at just 0.8 Mbps per second. For comparison, the global average is a connection speed of 2.6 Mbps. Hong Kong is also home to the highest average peak connection speeds in the world, with an average of 54.1 Mbps. This is followed by South Korea and Japan, with average peak connection speeds of 48.8 Mbps and 42.2 Mbps respectively. Hong Kong’s top average peak connection speed marks the highest average peek connection ever recorded. Vietnam, India and China, on the other hand, appear at the bottom of the average peak connection speed chart. They are the only countries in the Asia Pacific with average peak connection speeds of below 10 Mbps, with 8.6 Mbps, 8 Mbps and 7.1 Mbps respectively. To put this in context, the world average peak connection speed tops out at 15.9 Mbps. 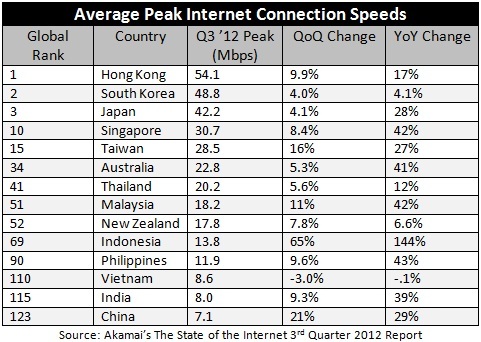 The growth of internet speeds in Asia is very promising. While average connection speeds in Taiwan only grew by 7.1 percent in the last year, speeds in Indonesia grew by 58 percent. India’s average peak connection speed has increased by nearly 140 percent since 2007, while China’s average peak connection speed has increased by 250 percent during the same period. Except for Taiwan, all of the countries in the region saw yearly increases, and grew by at least 10 percent. Despite somewhat lower internet penetration rates throughout Asia compared to the rest of the world (its internet penetration rate is only about 27 percent), the region does hold 42 percent of the world’s internet users. China has a total of 513 million users, followed by India with 121 million, Japan with 101 million and Indonesia with 55 million. China’s Ministry of Industry and Information Technology (MIIT) has publicly predicted that China’s internet user base will reach 800 million by 2015. Within Asia, the highest penetration rate can be found in South Korea (82.7 percent), followed by Japan (80 percent), Singapore (77.2 percent), Taiwan (70 percent) and Hong Kong (68.7 percent). 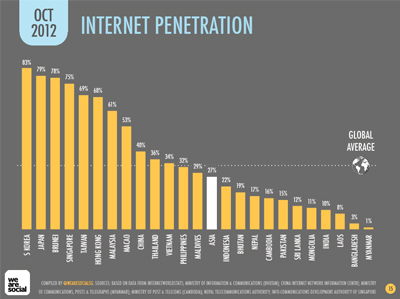 On the other hand, China only has an internet penetration rate of about 40 percent. With only three countries in the top 10 global list, however, Asia still has much work to do to increase internet penetration in the region.